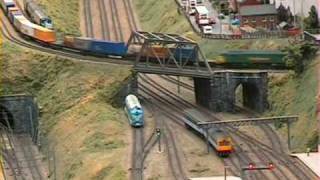 This is footage taken of our Modern Image ‘N’ Gauge Model Railway ‘Littlewood’ at a Model Railway Exhibition near Wolverhampton. The layout was exhibited all around the UK between 1996 and 2007, attending over 50 shows. The track plan comprises a double track mainline which passes through three levels; on the middle level it is joined by two slow lines, making a quadruple section. The lower level mainline is equipped with overhead catenary for electric services. A disused branch line from the upper level has been taken over by a preservation society, who are in the process of restoring it for steam and diesel operation. The station has been renovated for use as a base for passenger services and locomotive restoration and a limited shuttle service is operating over part of the line.